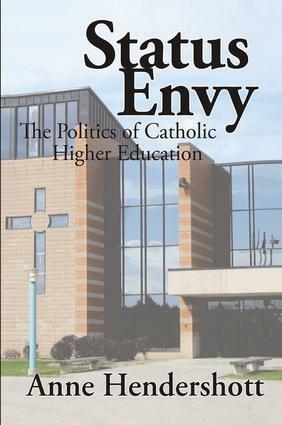 The debate within Catholic educational circles on whether church sponsored colleges and universities perpetuate mediocrity by giving too great a priority to the moral development of students instead of scholarship and intellectual excellence continues in this book by sociologist Anne Hendershott. She asserts that part of the reason for the crisis of faith within Catholic colleges is due to status envy--the desire to compete with the top colleges in the country. Catholic universities are generally not rated as top-notch. They are viewed as having a lower status than secular institutions, which, of course, creates resentment. Catholic universities, in turn, become more secular as they become consumed with status concerns. Detailing how this resentment manifests itself on campuses, Hendershott explains faculty and administrative attempts to distance universities from Catholic ideas and curriculum. Some have distanced themselves so far from their Catholic origins that the church no longer recognizes them as Catholic institutions. The author questions whether even determined Catholic universities will be able to avoid the pressures to become more secular. Hendershott, who clearly sympathizes with the original mission of Catholic universities, leads the reader through the earliest signs that Catholic colleges were beginning to lose their way in the 1960s, up through the ongoing issues of feminism and homosexuality and their impact. In focusing on these secular issues, colleges are denying exposure to the traditional Catholic views on subjects such as homosexuality, women's ordination, and abortion. Like all culture wars, the interaction among people defines the situation. The campus is a reflection of the greater culture between those who assert that there are no truths, only readings--and those who believe that the truths have been revealed and require constant rereading and application. It is a conflict between those dedicated to the negation of the authority of Scripture and the hierarchy of the church, and those proposing a renaissance of the Catholic intellect and a renewed appreciation of the church itself.